After Mass parishioners will have a chance to meet Bruce and gather more information on the work of Pax Christi. All welcome, this is an open meeting to mark Peace Sunday. Fr Gerry is a member of Pax Christi’s nonviolence working group and will speak and facilitate discussion on the theme, Blessed are the Peacemakers. Christian teaching about war and conflict has moved from the ‘just war’ theory of Augustine and Aquinas in the light of renewed commitment to the non violence of Jesus. What are the tools of non violent conflict resolution today? 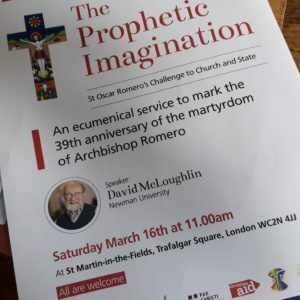 An ecumenical service to mark the 39 anniversary of the martyrdom of Archbishop Romero with speaker David McLoughlln, Newman University. Supported by St Martin in the Fields, CAFOD, Missio, Pax Christi, Christian Aid, NJPN and Embassy of El Salvador. 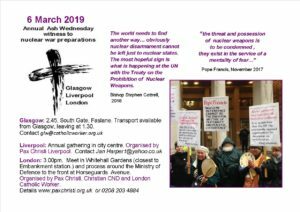 Pax Christi Liverpool will be showing the film Of Gods and Men, and leading a discussion /reflection in the light of the work of the Catholic Nonviolence Initiative, a project of Pax Christi. Linked to the journey of Holy Week and Easter. “We are in a high risk situation here and now but we persist in our faith and our confidence in God, ,dying here and how. Does it serve a purpose?” quotation from the film.